Once the site of a major ICI chemical works, Ardeer lies at the head of the Ardeer peninsula, now part of Stevenston, North Ayrshire, and was a dominant global supplier of explosives to the mining and quarrying industries and a major player in the design and development of products for the chemical and defence industries during the 20th century. The Ardeer peninsula was the site of a massive dynamite manufacturing plant built by Alfred Bernhard Nobel (October 21, 1833 � December 10, 1896), inventor of dynamite, and founder of the Nobel Prize. Having scoured the country for a remote location to establish his explosive factory, Nobel finally acquired 100 acres (40 Ha) from the Earl of Eglinton, and established the British Dynamite Factory in 1871, and went on to create what was described then as the largest explosives factory in the world. The sand and dunes on the site provided natural safety features for the plant and workers, further enhanced by the formation of blast walls and bankings, designed to direct the force of an explosion upwards and away from neighbouring facilities, rather than sideways, which could have resulted in a chain reaction which could have spread throughout the plant. While the production facilities were located on the isolated site at Ardeer, the company's offices were located in Glasgow, as depicted on the product labelling, as shown in the example to the right. The British Dynamite Co Ltd was formed in 1870 by Alfred Nobel to produce and market his new explosive 'dynamite'. The factory was set up at Ardeer, on the coast at Ayrshire, with production beginning in 1873. In 1876, following Nobel's discovery of blasting gelatine, Nobel's Explosives Co Ltd was formed, comprising Ardeer, and also Westquarter Works for detonator manufacture. In 1918, several important concerns were merged with Nobel's Explosives Co Ltd to form a new company called Explosives Trades Ltd, later renamed Nobel Industries Ltd. The new combined firm produced blasting gelatine, gelignite, ballistite, guncotton, cordite, and 'safety fuse' as well as several spin-offs from the original companies. The firms involved included Kynoch Ltd (mainly making cartridges and explosives but with several spin-off industries as discussed below), Curtis & Harvey (explosives), Eley (ammunition) and some metal processing firms such as Kings Norton Metal Co (brass and copper strip rolling and rod extrusion as well as interests in coin minting and ammunition), and Birmingham Metals and Munitions Co (rolled copper and brass and solid-drawn brass cartridge cases). In 1926, Nobel Explosives became a founding member of Imperial Chemical Industries (ICI), and merged with Brunner, Mond & Company, the United Alkali Company, and the British Dyestuffs Corporation, creating a new group, Imperial Chemical Industries, then one of Britain�s largest firms. In 2002, Nobel Enterprises was acquired by Troon Investments Ltd, a subsidiary of Inabata & Co Ltd, Japan, having previously been a free standing business within ICI. Nobel House has existed in various guises through the years. By 1907, Nobel�s Explosives Co Ltd head office was located at Nobel House, 195 West George Street, Glasgow. Some years later, Africa House, which was originally the South African Pavilion built for the 1938 Glasgow Exhibition, was transported to the Ardeer site where it became Nobel House, and served as a staff restaurant while the site was in operation, but now lies derelict, burnt-out, abandoned and decaying. 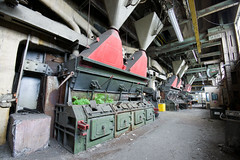 The area continued to develop and diversify over the years, with an iron works, and then new facilities for chemical manufacturing being added in the 1960s. 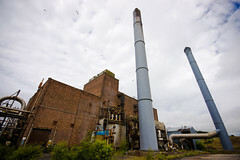 These plants produced nylon, nitric acid, and a synthetic tobacco substitute, and brought two tall chimneys and a large cooling tower to the site. Unfortunately, like the cooling tower (which collapsed during a storm), these new facilities were relatively short-lived if not related to explosives production, and closed after about 12 years. Having employed some 18,000 at its peak, most of the site now lies derelict, leaving only a relatively small plant involved in the manufacture of explosive related chemicals and equipment, and an industrial estate - the Nobel Business Park. The aerial views provided below show that much of the protective earthworks constructed on the site still remain as originally constructed, created with the intention of deflecting blast and debris upwards in the event of an accident or explosion. 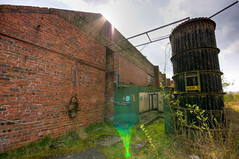 Examination of these views has revealed a construction similar to a drum blender building previously identified within the former munitions factory site of ROF Bishopton. 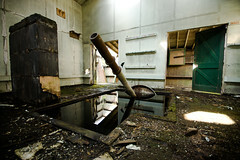 In the northern part of the Ardeer site are a series of WWII-era press houses. These long buildings have a series of bays protected by blast walls, each bay would have contained a cordite press which extruded cordite paste onto a table for cutting into lengths. 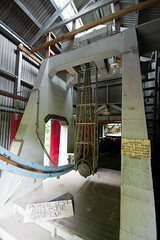 The presses were driven from motors situated in a long corridor at the back of the press house, under the enclosing earth mound. 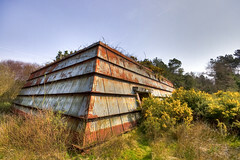 The press houses have been abandoned in stages, earlier ones have remnants of wartime pencil graffiti, later ones were in use until quite recently. A black powder incorporating house was where the raw ingredients of gunpowder were mixed - the mixing was done by an edge-runner mill, two giant rollers running in a pan to crush the ingredients together. 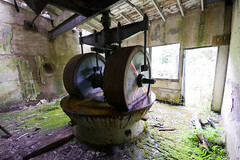 An incorporating house still remains in the woods of Ardeer, containing three edge mills - the lines on the mill rollers are so the operator can make sure the rollers are rolling, not scrubbing. ICI Ardeer had an extensive laboratory section, testing explosives and detonators using equipment often developed on-site, including their own high-speed plate cameras. Test explosions were observed through viewing slits in a series of blast-proof buildings, and filmed on plate cameras and with high-speed film cameras. The explosive power of a charge was tested using a ballistic test mortar - a measured charge was detonated in a mortar attached to a giant pendulum, and the height of the recoil gave the strength of the charge. Many processes in explosive manufacture require steam, heat or power - in most explosive factories, this is provided by at least one on-site power plant, and ICI Ardeer was no exception. The power plant still standing is not the original, it probably dates from the '40s or '50s. Three coal-fired boilers provided steam which was sent through insulated overground pipes to buildings all over the factory, and there was also enough steam to drive two electrical generators. At its peak, the site employed almost 13,000 workers in a fairly remote location, and had its own railway station. Originally the Ardeer Works Platform, this was shortened to the Ardeer Platform. The station operated from 1834 until 1966, initially operated jointly by the Caledonian and Glasgow & South Western railways and later by the London, Midland and Scottish Railway, and finally British Railways. The station was used solely for workers and those special visitors with business in the ICI plant, and was never a regular passenger stop. Until the mid 1960s, there were two trains per day to transport workers. Although the line no longer exists, the abandoned platform remains, hidden beneath dense undergrowth. The former Western Scottish Bus Company provided tens of buses per day to transport the workers to and from the site, which was almost like a community, with enough people employed there to have a bank, travel agent, and dentist based on the site at one time. ICI Ardeer was commonly known locally as the factory or the dinnamite. At the time the company generally provided higher quality employment regarding terms and conditions and pension rights than other local firms. On September 8, 2007, about 20:00, a large explosion occurred at the site, with reports of the blast being made from distances of up to 20 miles. The subsequent blaze involved up to 1,700 tons of nitrocellulose (used in ink and coating manufacture) stored on the site, with 20 fire appliances and 75 firefighters attending. Strathclyde Police later stated that three boys, two aged 14 and one aged 10, were the subject of a report to the Children's Panel in connection with the incident. It would appear that the operations at Ardeer, Stevenston, Ayrshire, Scotland, were mirrored to a remarkable degree by those at Ardeer, Melbourne, Australia. We're grateful for the following notes, which were made from a some archived postings made some years ago in an Ayrshire forum. Ardeer Railway Station was built in 1935, but paid for by ICI, since its only use was to bring workers to the ICI Site. It would appear that ICI's funding of the station gave them "naming rights", and they named the station Ardeer after the parent Company's major explosives manufacturing site at Ardeer, Ayrshire, with the suburb to follow. The Melbourne station was originally sited on ICI property, on what is now Tilburn Road, immediately west of Fitzgerald Road. It was later moved to its current site in Forrest Road. There was a further, if wider, connection with the regard to the use of Scottish and English names on a housing estate near Deer Park. The site was developed by ICI, building the houses there to attract worker into the area for employment in the nearby factory, and establishing their own Building Society to help with purchases. Many of the streets took their names from town in Scotland and England where ICI facilities were located, including: Billingham, Blackley, Crosslee, Dumfries, Earlsfield, Huddersfield, Irvine, Runcorn, Slough, Stevenston, Stoke, Wandsworth, Welwyn, Widnes, Winnington. Kororoit Creek is said to be one of the most desirable locations in the area, and contains Millbank Drive. The world headquarters of ICI are located in London, England, at Millbank on the Thames river. ICIANZ became ICI Australia in 1971, and in July 1997, ICI sold its stake in the Australian operation, which then changed its name to Orica, when the new company acquired ICI's global explosives operations. The British Dynamite Co Ltd was set up as a limited liability company in 1871, under the chairmanship of Charles Randolph (1809-1878), shipbuilder. The purpose of the company was to develop and sell dynamite, a form of nitroglycerine absorbed in Kieselguhr, a clay-like material, which, shaped and cut into lengths, could be handled fairly safely. This, together with a safety fuse and detonator, had been the inventions of Alfred Bernhard Nobel (1833-1896), a Swedish born chemist and businessman. Establishing himself in, first, Sweden and then Germany, Nobel determined to expand the business further. He could raise little interest, at first, in the USA or in England, but a group of Glasgow businessmen including John Downie and George McRoberts, at that time a partner in the firm of Westquater Chemical Co, raised the initial capital of GBP 24,000. Nobel was paid for his rights and for the work he subsequently undertook as technical adviser, in shares. In time he came to own half the original capital as well as having a profit-sharing agreement. The company set up its head office at 7 Royal Bank Place in Glasgow, Scotland, but established works in Ardeer, North Ayrshire, Scotland, along the shore of the Firth of Clyde between Stevenston, North Ayrshire, and Irvine, North Ayrshire. Production of dynamite began in 1873. In 1874, The British Dynamite Co Ltd had 19 agencies in the British Isles and supplied and delivered dynamite to all locations in the British Isles. They were the sole proprietors of Alfred Nobel�s patents for �superior blasting powder�. Production of detonators began in 1876 at the Westquater factory, owned jointly by Nobel and George McRoberts. The company was reorganised in 1877 as Nobel�s Explosives Co Ltd, with capital of GBP 240,000. Nobel continued to set up new businesses, so that, by 1886, there were some 15 independent corporations dealing in the production and sale of dynamite. This led to some fierce competition, in spite of the fact that Nobel continued to be a large shareholder in all the companies and to act as an adviser on matters commercial as well as technical. In 1886, encouraged by Nobel, the Nobel-Dynamite Trust Co Ltd was set up in England, with a registered office in London, as a holding company whose shares were exchanged for the shares of five subsidiaries; four German and the largest, Nobel�s Explosives Co Ltd. This sort of multi-national trust company represented a very advanced form of organisation for its day, particularly in Great Britain. By 1907, Nobel�s Explosives Co Ltd, whose head office was now located at Nobel House, 195 West George Street, Glasgow, was a contractor to the British Government. Subsequently, Nobel turned his attention to the invention of a smokeless powder, ballistite, which was to have great significance for the armaments industry. Work continued at Ardeer and Westquater in the production and development of explosives and detonators through and after the two world wars. By 1926 Nobel�s Explosives Co Ltd had been absorbed into Imperial Chemical Industries Ltd, Nobel Division. By 1972 this division was an independent trading organisation of ICI Ltd.